I’ve had a stye in my eye for the past few days and it has been driving me up the wall. I haven’t had an eye infection since I was a teenager, and I am more sensitive and freaked out by eyes than the average soul. If I watch someone put in contact lenses I will weep rivers of tears–the idea just freaks me out. Did anybody tell you YOU ARE TOUCHING YOUR EYE!!! STOP THAT! The glaucoma test at the optometrist? Murder for me. Hell on earth would be LASIK surgery–aargh–I just had full-body involuntary shivers thinking of it. It’s kind of weird, then, that one of the most powerful and life-changing voluntourism experiences I ever had was with Relief Riders International in Rajasthan, India. A group of us were on horseback in the Thar Desert, riding from tiny village to desolate rural outpost, camping along the way, and we, with a team of doctors, were setting up free medical and dental camps as well as delivering school supplies to kids and immunizing them, and donating/delivering milking goats to the poorest families in the region. 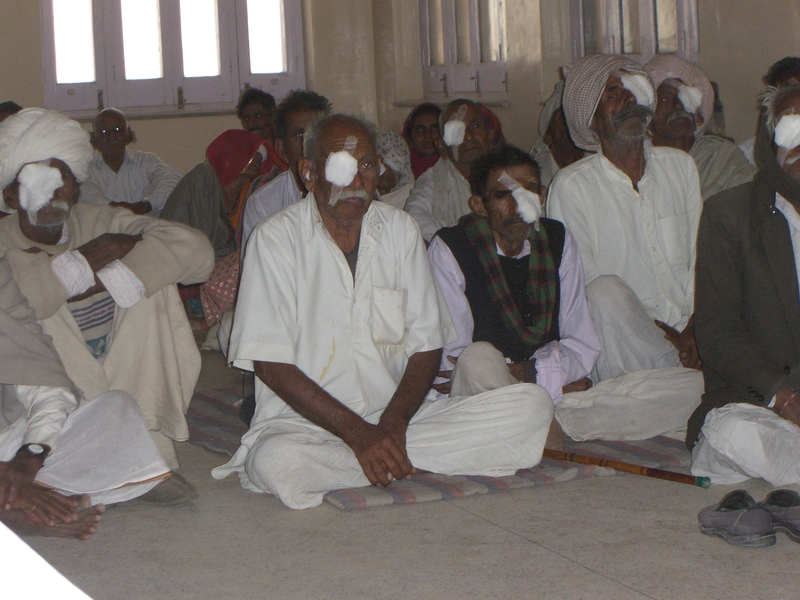 The eye connection is this–one of the main projects was a free cataract eye surgery camp. Desert-dwelling individuals who have never had sunglasses are prone to cataracts at very early ages, and this medical team goes into rural villages and screens hundreds of potential surgical patients in a day. Those who qualify receive sight-restoring surgery the following day as the surgeon works tirelessly through the night, sitting between two hospital gurneys (set up in a school when we were there), working first on the patient on the left, then as that one is wheeled away, the surgeon simply pivots on the stool and immediately begins the next surgery on the right–and on and on. It is an astounding and efficient process, maximizing every potential to save sight. The patients–some of whom have never had professional medical care of any kind, do not pay for the surgery. Donations Give the Gift of Sight to those who would surely lose their vision without the program. Think about donating. Eighty-five bucks and someone can see again. Think, also, about possibly joining a Relief Ride–I promise it will rock you to the very core. There are rides in India, and now Turkey as well. Even if you aren’t comfortable on horseback, you can join the caravan (by Jeep–occasionally, perhaps, by camel) and participate fully in camp life and the service parts–the most important parts–of the trip. Now I have to go put a teabag on my eye–I’m getting squeamish all over again.